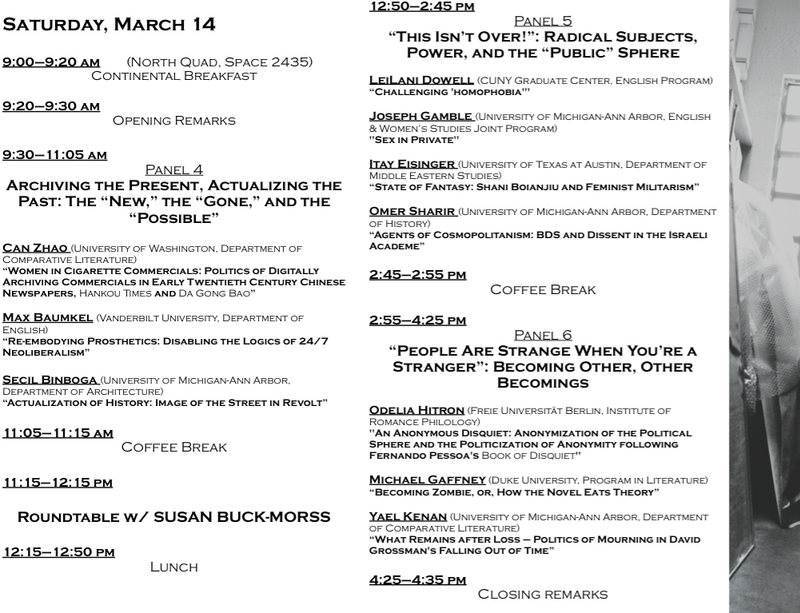 Official Conference Schedule – March 13-14, 2015. Once again, we want to thank everyone who attended and helped publicize the last two reading group meeting, which were truly engaging and inspiring! The CLIFF Organizing Committee will be holding the third and final pre-conference reading group meeting on Monday, February 23rd from 4:00-6:00pm. The meeting will take place in the Comparative Literature Department Library (2015 Tisch Hall). We will have food and refreshments for all participants. Lastly, for those who have time, we encourage you to read Walter Benjamin’s “On the Concept of History” (Belknap edition). This is not among the required readings for our third meeting, but we would very much like to discuss Professor Buck-Morss’s famous methodological inheritance and reworking of Benjaminian concepts and, especially, how we can utilize, extend, or challenge her approaches in our own work. 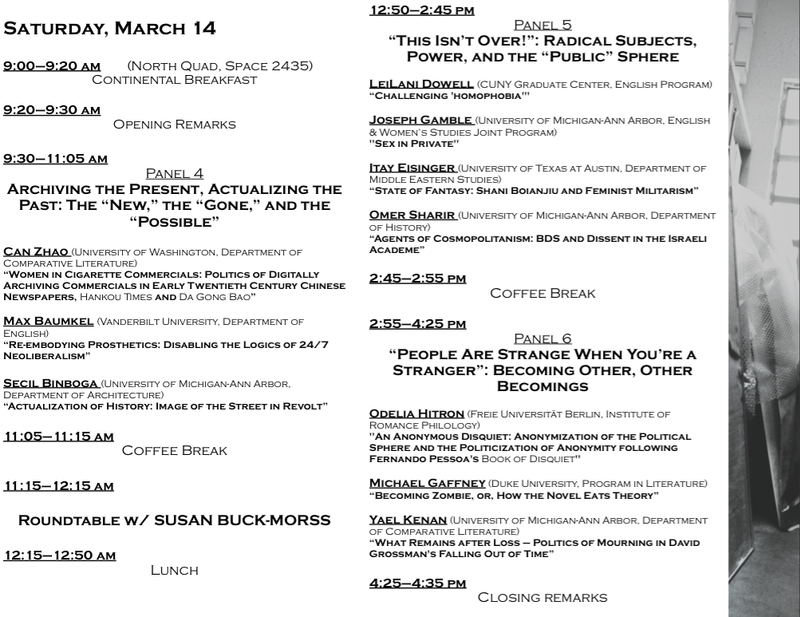 As we move closer to the conference dates (March 13-14), this reading group has been a wonderful resource for all of us to address key questions/concerns about the state of “the Left,” the political nature/ventures of our own work, the conditions of academia that constitute and limit our own political strivings, etc. We have all been eagerly anticipating a discussion of Hegel, Haiti, & Universal History, and we hope that this final meeting will provide a platform for us to address residual (“leftover”) concerns but also to chart a direction for future studies, teaching, political activities, etc. NOTE: IF YOU PLAN TO ATTEND OUR READING GROUP MEETING, PLEASE EMAIL US AT leftoversumich@gmail.com TO LET US KNOW THAT YOU WILL BE ATTENDING. This will help us make adjustments for space, catering, seating, etc. We want to thank everyone who attended and helped publicize the last reading group meeting, which was a tremendous success! The discussion was productive, genuine, and inspiring, and we are excited to see what will develop in the following two meetings. The CLIFF Organizing Committee will be holding the second of our three pre-conference reading group meetings on Monday, February 9th from 4:00-6:00pm. The meeting will take place in the Comparative Literature Department Library (2015 Tisch Hall). We will have food and refreshments for all participants. Lastly, for those who have time, we encourage you to read James D. Ingram’s”Rethinking Ethical Cosmopolitanism: From Universalism to Universalization” from Radical Cosmopolitics: The Ethics and Politics of Democratic Universalism. This is not among the required readings for our second meeting, but we feel that our conversation would only benefit if those involved were able to familiarize themselves with Ingram’s piece on the implications of cosmopolitan values and politics in the 21st century. Extremely exciting political developments are occurring in Greece, Spain, and across the world right now (we could even, perhaps, call the Greek elections an event). At the same time, though, we hardly need to be reminded of the greater losses that are being suffered in every corner of the globe, and it is with a determined will and communicative openness that we will attempt to comprehend and engage these actualities without falling into the abstract, ontological airiness of a historically unmoored “speculative leftism.” We truly hope that you will be able to join us on February 9th! NOTE: IF YOU PLAN TO ATTEND OUR READING GROUP MEETING, PLEASE EMAIL US AT leftoversumich@gmail.com TO LET US KNOW THAT YOU WILL BE ATTENDING. This will help us make adjustments for space, catering, seating, etc. The CLIFF organizing committee will be holding its first of 3 pre-conference reading groups on Monday, January 26th from 4:00-6:00pm. We are extremely grateful to Professor Susan Buck-Morss, who has generously agreed to join us via video-conference for this meeting and the subsequent two meetings leading up to our conference in March. As of right now, the location for this first meeting will be the Comparative Literature Department Library (2015 Tisch Hall). PARTICIPANTS BE ADVISED: if, for any reason, the venue changes, we will post updates here. Please check this website regularly to make sure you are up to date. This event is open to graduate students and faculty. All participants are expected to complete the reading before the event begins. The circumstances of this gathering, of course, extend far beyond our preparation for the March conference. The fatal Charlie Hebdo shootings in Paris on January 7th (and the largely overlooked, widespread massacres in Nigeria by Boko Haram) have provoked self-righteous and reductive responses from media sources, world leaders, protestors, etc. that resonate alarmingly with the same discourses and power relations addressed by Professor Buck-Morss in Thinking Past Terror 12 years ago. These events have also charged new and existing countercurrents of critical discourse from intellectuals, dissidents, radicals, and others across the globe–countercurrents that put into focus the immanent demands made on and by the Left in the “global public sphere.” This will be the context in which we revisit and discuss Thinking Past Terror and “A Commonist Ethics” on January 26th, and we strongly urge participants to share articles, clips, thoughts, etc. dealing with these current events on the comments section. NOTE: IF YOU PLAN TO ATTEND OUR READING GROUP MEETING, PLEASE EMAIL US AT leftoversumich@gmail.com TO LET US KNOW THAT YOU WILL BE ATTENDING. This will help us make adjustments for space, seating, etc. We hope to see you all on January 26th. LEFTovers: What’s L/left of Literature and Critical Theory in the 21st Century? Are the humanities inherently “progressive”? Is such a belief—if, indeed, we have it—a legacy of “the Left” in academia, and is it a legacy that all of us, whether we’re “on the left” or not, must somehow deal with in our scholarship? Those of us in the humanities have been charged with answering for all our “theory,” for our love and vulnerable loving of literature, and for what they’ve wrought. And such charges seem inextricably bound up with the accusations of left failure, crippling relativism and abstraction, and the “Americanization of theory” (Keucheyan, The Left Hemisphere), which has supposedly depoliticized/institutionalized our passionate talks and reduced them to just that, talk. Have we been relegated to—or have we willingly and hermetically sealed ourselves within—familiar echo chambers of resonance and relevance? To whom, and to what ends, are our calls directed? To which calls do we feel ethically bound to respond? Such questions implicate and address all of us; they insist, they demand. The idea for this conference has been largely influenced by recent debates and published volumes on the remains of “progressive” politics in the humanities. At the same time, the concept of “leftovers” is as concerned with remains as it is with waste—what needs to be cleared away. How, in our irreducibly heterogeneous disciplines/fields, is our work and academic practice still shaped (for better or for worse) by residual legacies of leftist politics? What must be retained? refashioned? purged? We invite abstract submissions from across a range of disciplines that will aim to (re-)interpret and (re-)assess the implications of what is “Left” and “left” of literature, literary scholarship, and theory in the 21st century. Susan Buck-Morss is Distinguished Professor of Political Science at the CUNY Graduate Center and Professor Emeritus in the Department of Government at Cornell University. Along with numerous articles, her works include the recent and widely influential study on Hegel, Haiti, and Universal History, along with others, such as: Thinking Past Terror: Islamism and Critical Theory on the Left; Dreamworld and Catastrophe: The Passing of Mass Utopia in East and West; The Dialectics of Seeing: Walter Benjamin and the Arcades Project; and The Origin of Negative Dialectics: Theodor W. Adorno, Walter Benjamin, and the Frankfurt Institute. Please send abstracts of no more than 350 words to leftoversumich@gmail.com by December 1st, 2014.